On April 16, Egypt’s second remote sensing Earth observation satellite was launched from the Baikonur Cosmodrome on a Soyuz-U rocket. On June, I spotted a heavily tumbling object that was the upper stage of this launch. It showed an impressive flashing pattern of roughly 1 flash per second. I observed the rocket stage several times visually and captured it in high-resolution on June 24. The two movies are made of raw frames from the original video and show the actual movement of the rocket stage clearly. Both movies show different parts of the pass and we see a comparable flashing pattern. The second movie shows a slight double image which is a seeing effect at diffraction level. This is actually a sign that the diffraction limit of the telescope is reached and also a demonstration of the small angular size of this Soyuz rocket stage at this distance. 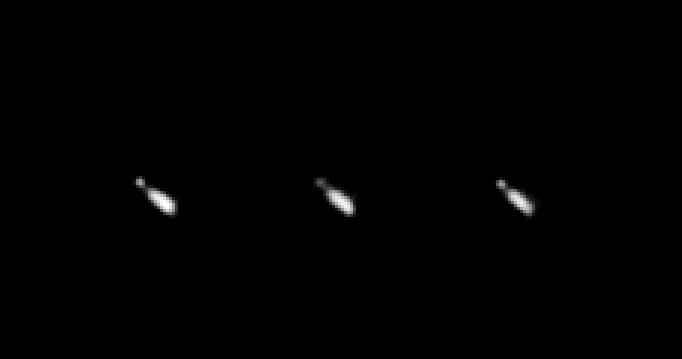 The image-set shows still images from the sequence taken at the moment the rocket is facing its long side towards the camera. The distance of this Soyuz-U upper stage was at the time of imaging 729 kilometers while it was 688 kilometers above the ground. Aquiring this resolution and clearness from a distance of over 700 kilometers, considering the size of the object, is not commonplace. The images are taken with a new high-resolution black&white camera attached to a 10 inch aperture reflecting telescope. Active skywatchers are pretty well familiar with the phenomenon of a flashing satellite, in many cases an object in Earth orbit that is tumbling about one or more axes. Sunlight is reflected less or more during this tumbling motion as we see alternately different surfaces of the object. This can be, for example, the long side or short side of a rocket body. For decades, satellite observers couldn’t do more in this field than just observe the brightness-pattern of a tiny point of light, like we see a satellite with the naked eye, in binoculars or telescopes at low magnification. Imagine the amazing possibility to observe the tumbling motion of a malfunctioning satellite or spent rocket stage in high resolution, so that you could actually see the object rotating, not just a flashing point of light. It would be possible to study the flashing pattern and the related attitude of the object in space in great detail. This is an almost untouched field in astrophotography, not only due to the harsh degree of difficulty, but also because this is a relatively unkown field, but nevertheless incredibly interesting. I have been an active satellite observer for years and I was fascinated by the tumbling space debris in the night sky from the beginning. In the last years I started to photograph difficult targets and to develop techniques to visualize the motion of objects on their own axes. I would become a pioneer in this field. First experiments looked very optimistic and showed clearly tumbling motion of upper stages of Soyuz rockets that launched Soyuz and Progress spacecraft into space. In practice, it’s not easy to realize this and the technique is even harder then capturing normal satellites with a telescope in high resolution, especially when using manual alignment with the crosshairs in the tracking scope, the technique that I and others mainly use. Remember that you can only spot the object in the moment that it is producing a flash. These flashes are usually very short in the case of tumbling objects such as rocket stages. So you can only see the rocket in the moments of these short flashes and between these flashes it’s almost invisible. Even when the rocket stage would not completely dissapear during a minimum, it still is very hard to track because the harsh contrast between a minimum and a maximum tends to make you crazy. It’s like entering and leaving a dark tunnel many times in succession once a second or even faster. In 2011, the second stage of a Zenit rocket provided an amazing show that was captured in great detail when it crossed the telescope field. Keep up the good work Ralf!